Dorothy Je'nae (Burns) Packer was born in Ozark AL. on Dec. 4,1952 to Thomas Burns and Nettie Jackson. Affectionately called Aunt Dot or Mom Packer, received her education through Florida public school system and later moved to Baltimore. She was filled with the Holy Ghost at an adolescent age. She relocated to Tampa, Fla., Baltimore, Md. 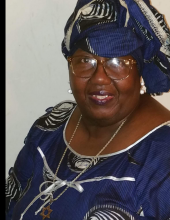 In late spring 1990, Mom packer relocated to Wilmington, DE., with her husband of over 30 years, Johnny Packer, where she served at Full capacity at Tower Of Power Church of Deliverance under the Leadership of Bishop Issac R. Burns. On August 1, 1999, Mom Packer heard the voice of God as she opened Faith Praise Temple of Joy Ministries. In June 2003, she relocated to Baltimore, Md., and worked for Johns Hopkins but was forced to retire early after 14 years of service due to her illness. She leaves to mourn Johnny Packer (Husband), Ruby Marish(sister), Mary Thomas(sister), Jon'Nae(daughter), Tye (Son), Tavi (niece), BB (granddaughter), Nyee (Granddaughter) along with a host of other nieces, nephews and cousins. To send flowers or a remembrance gift to the family of Dorothy Ja'nae Packer, please visit our Tribute Store. Or, if you would like to donate to the family, please visit Dorothy's Tribute Fund. Help ease the financial burden placed on the Packer Family after the loss of a loved one by making a donation. "Email Address" would like to share the life celebration of Dorothy Ja'nae Packer. Click on the "link" to go to share a favorite memory or leave a condolence message for the family. Provide comfort by sending fresh flowers from our local florist or donating to Dorothy's Tribute Fund.